Before the provincial government established an office in the district of Fort George, men looking to pre-empt land in the area faced a long and daunting process. Applicants were required to correspond with government agents working in offices hundreds of miles away, relying on letters carried by sternwheeler, stagecoach and dogsled to complete the multi-step process. It could take six months or more to reach a final decision, and success was not guaranteed. The new office would serve the two competing townships of Central Fort George and South Fort George, as well as outlying areas of the Fort George district. The building at left, with a porch and two chimneys, is the original provincial government office built on Hudson’s Bay Company land in mid-1911. The addition on the office’s left side, as well as the jail and other administrative structures, were erected later in 1911. Map of the Fort George District as it existed around 1910, (adapted from a map published by Rev. F. E. Runnalls in his book A History of Prince George). The red circle identifies the Hudson’s Bay Company site upon which the provincial government offices were built. 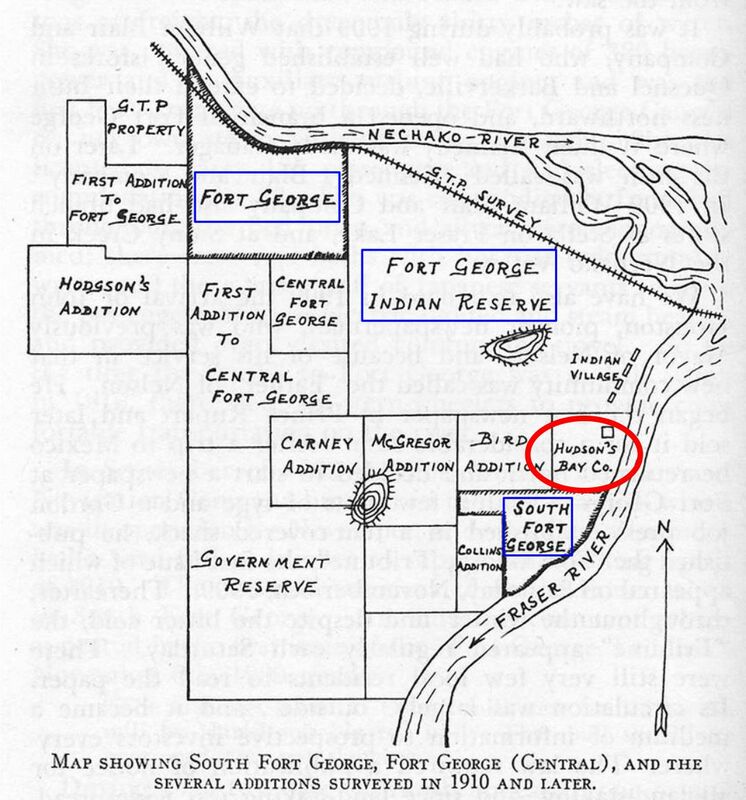 The blue squares identify the competing townships of (Central) Fort George and South Fort George, as well as the Fort George Indian Reserve that eventually became the township of Prince George. Construction began in mid-May, 1911, at a site next to the Hudson’s Bay trading post, on land owned by the Hudson’s Bay Company, (a location now occupied by The Exploration Place museum). Some voices complained that the site was “too remote…from the populated area”2 — it was almost two miles from Central Fort George — but the location served a purpose: it detached the provincial government from the ongoing township rivalries, and it enabled the government agent to serve as a neutral party to residents of both communities. By late June, 1911, the new office was open for business: a 1,196 square-foot, one-room structure complete with front porch, steel shingles, two concrete chimneys and an “attractive rustic design.”3 Government agent Thomas W. Herne held the floor, presiding over the recording of pre-emptions and other government affairs. The original office was quickly flanked by other administrative buildings, including a courthouse, police barracks and jail. The provincial government also improved access to the site by installing two ferries — one on the Fraser River immediately opposite the Hudson’s Bay post, the other on the Nechako River a short distance beyond Central Fort George. The office served the Fort George district until 1923, at which point provincial government operations moved to larger quarters in the former Alexandra Hotel building at the corner of Third Avenue and Brunswick Street. Herne’s term as local government agent also ended with the change in office location; he was succeeded by George Milburn. “Government offices to be erected immediately. Will be located on the Hudson’s Bay Company’s property,” Fort George Herald, 1 April 1911, page 1. “A community without a jail,” Fort George Herald, 24 June 1911, page 1. “Looking over townsite with view to improvements,” Fort George Herald, 27 May 1911, page 1. 14 January 1911 – Untitled, page 2. 1 April 1911 – “Government offices to be erected immediately. Will be located on the Hudson’s Bay Company’s property,” page 1. 27 May 1911 – “Looking over townsite with view to improvements,” page 1; Untitled, page 1. 24 June 24 1911 – “A community without a jail,” page 1. 5 August 1911 – “‘The Machine’ dismisses government agent Walker,” page 1. 7 June 1923 – “Alexandra Hotel property purchased by government,” page 1. 2 August 1923 – “Contract let for alteration of Alexandra,” page 1. Runnalls, Rev. F. E., A History of Prince George, 1946. March 6, 2015 – Happy 100th birthday Prince George!